Last Friday I had the opportunity to go visit the headquarters of Genius Factor Games  and sit down with the CEO Ted Nugent to talk about their new release “Riese” for the iOS platform. 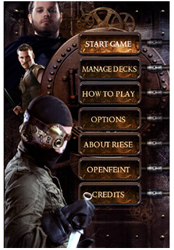 The game is based on “Riese The Series ” web show, which has been picked up for digital broadcast by Syfy.com . Riese The Series will begin airing on October 26th under its new title, Riese: Kingdom Falling, and Riese the Game will be launched in the App Store at the same time. The game is a card based strategy game in which you play as one of three factions The Sect, The Eleysian’s or The Resistance with the goal to take over the world. As you try to gain control of the Riese world provinces, for each province you try to take over you must battle the computer or online opponent and gain control of 75% of the game board by placing your troops and defeating the bad guys. As you progress you will unlock new cards for your battle and using open feint some nice achievements. Fans of the series will be glad to know that you can use the heroine Riese as a character and her trademark wolf Fenrir in battle. The game looked really nice when I got to take a look at it, the graphics were polished and the audio sounded good.The controls were easy to pick up and learn. I will also mention I was surprised to learn that the narrator for the game is Felicia Day from The Guild. When the game launches it will have 3 difficulty settings for you to choose from. In the version 1.1 release local multiplayer will be added so you can battle your friends. The group at Genius Factor Games is optimistic that the game will be enjoyed by the Series’ fans as well as gamers who enjoy strategy card games. Riese tells the story of a banished princess on the run from a dangerous religious sect in a steampunk inspired world. It stars Allison Mack (Smallville), Ryan Robbins (Sanctuary), Alessandro Juliani (Battlestar Gallactica), Patrick Gilmore (Stargate Universe), Emilie Ullerup (Sanctuary), Sharon Taylor (Stargate Atlantis), Ben Cotton (Harper’s Island), and in the title role, Christine Chatelain (Sanctuary). Riese The Game will be available this October in the iTunes App Store for $3.99.